The idealised land|water dichotomy is most obviously challenged by ice when ‘land practice’ takes place on ice or when ‘maritime practice’ is obstructed by ice. Both instances represent disparity between the legal codification of space and its social practice. Logically, then, both instances call for alternative legal thought and practice; in the following I will emphasise the former and reflect upon the relationship between ice, law and politics. Prior to this workshop I had worked more on the relationship between cartography, geography and boundaries than specifically on ice. 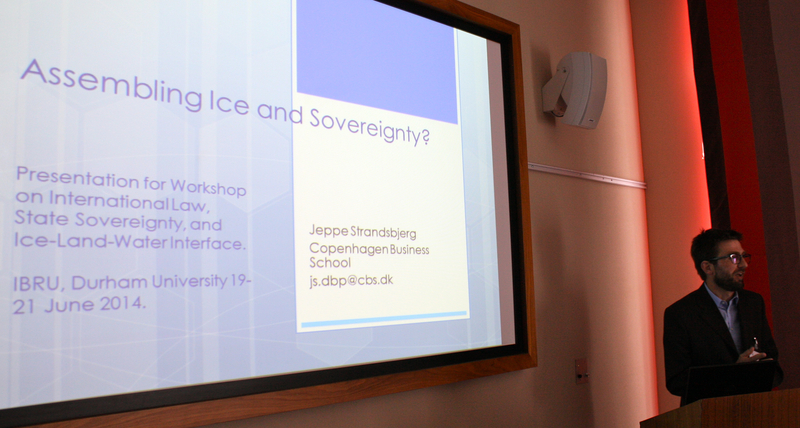 Listening to all the interesting conversations during the workshop, however, made me think that much of the concern with the Polar Regions in general, and the presence of ice in particular, reverberates around the question of how to accommodate various geographical presences and practices within the regulatory framework that we call international law. The absence of ice (except article 234) from the United Nations Convention of the Law of the Sea (UNCLOS) is curious. Historically, it is my understanding that the status of ice was discussed more broadly. Around a century ago, a French writer asked: ’…would not the durability of the frozen sea in this region [the Arctic] in spite of ice movements reported by Peary, and the relative stability of their geographical position make from the polar sea a kind of a peculiar territory? Does the legal status of ice differ from the status of land and water?’ What form this peculiar territory could have – as questioned during the workshop by Stuart Elden – or whether we can indeed talk about territory in an icy context is debatable. But, what seems fairly obvious is that the way in which ice is embraced (or not) by international law has important political implications. Seen from a perspective exogenous to law it is obviously paradoxical that ice is treated as water when the ice forms an integral part of a material infrastructure of some indigenous groups. As noted by the Inuit Circumpolar Council, thinking infrastructure in terms of the conventional land|water divide obscures the significant role that ice plays in bridging lands as well as constituting a particular type of hunting ground. The effect of this disparity between law, materiality and social practice is probably more significant than being simply a question of a legal gap or absence. International law is obviously political in the sense that it regulates relationships between communities but significantly it is also constitutive of a particular spatio-political reality. In effect the legal codification of ice as water establishes a hierarchical relationship between the conventional subjects of international law; that is, states, and other kind of socio-political organisations; in the example above, Inuit populations. In effect, the reluctance of international law to recognise the materiality of the Polar Regions as distinct constitutes a hierarchical relationship between different kinds of political organisation. I am not sure, however, that we should see the interventions by indigenous groups such as ICC as competing notions of territory. Rather, I would suggest, spatial practices highlighted by such groups show the deficiency of only thinking politics in terms of territory; and in effect, they are challenging the geographical assumptions informing the law. Bruno Latour once noted – polemically but nevertheless poignant – that the most significant incidence of European Colonialism was the insertion of a unified nature ‘behind’ differentiated polities. With this he points to the status of geography and thinking the world as a given, singular, and unified entity that provides the stage for politics rather than a being a question of politics itself. In effect, we tend to think about groups as having different cultures but all sharing the same global geography. Yet, what if geography – as many critical geographers and cartographers have pointed out – is not the basis for but the result of a political struggle? The obvious answer to this question is that the absence of ice from international law obstructs a meaningful conversation about what ice could mean politically and socially (and hence the workshop, I suppose). The straightforward solution would be to open for a legal debate about ice in order to provide a more inclusive and legitimate legal framework for icy parts of the world. Yet, it follows from above that either the law would seek to be unambiguous and hence codify ice in a distinct manner – and thus establish a hierarchy between different geographies – or the law would embrace a less settled categorisation of ice allowing for a negotiation between different geographies within the legal framework. While the latter might well be untenable in practice we could, and should, possibly start conversations about how particular usage of ice as transport, hunting grounds or spiritual sites can brought into a meaningful conversation with sovereign rights to demarcation, exploitation and navigation in icy spaces. This conversation would inevitably involve questions concerning cartography, as well, since any legal-spatial relationship would have to be mediated by cartography. And this is, on reflection, probably what I should have been reflecting upon but I was sidetracked by the inspiration from the workshop in Durham. Anon. (1909), from Le polê Nord et le droit international (cited by Machowski 1992: 157).